"I don't want to go to church this morning! There's no point," I told my husband despondently. Our eleven-month-old son hates being left in the church nursery, so I end up spending the service time in the nursing room or pacing the halls. Don't get me wrong. I am thankful for the nursing room because it's a sisterhood of nurturers. Yet looking at the rest of the congregation through the one-way window, we see and hear what's going on, but it's still not the same. Why does it seem like so much of motherhood has to be lived away from community? Most of life as a mother is worshiping when circumstances are inconvenient. Fortunately, God challenged my wayward thoughts and transformed my mind to think beyond me. He directed my focus toward the witness I have before my other three children in this season, nevermind my own spiritual well-being. What does it say to my children if I stay home from church, not because I have to, but simply because I'm frustrated that I need to spend the service tending to Josiah rather than being where I'd like to be—right in the service? Yes, being in the service is a good desire. But right now I'm called to worship right where I am—in the midst of inconvenience. Most of life as a mother is worshiping when circumstances are inconvenient. I read the Bible while my baby is tugging at my feet and my three-year-old is wanting my lap. I pray broken sentences in the car while there is arguing in the back seat, and I want to yell for quiet. I do get it "right" sometimes and wake up in the calm morning hours before the kids are up. Those mornings offer the ideal quiet times with God where I have the opportunity to really reflect on Scripture. There's a mug of coffee beside me and the promise of a bright day that began well. With small children or nursing babies waking in the night, those mornings are not going to happen on a regular basis. My time with God may have to be broken up throughout the day or delayed until evening. But God desires us as we are, not a flawless performance. Christ has already done that on our behalf. Through His strength, He enables us to pursue holiness. However feeble these earthly bodies may feel, we can find sustenance at His feet for another day . . . and another week. One of my favorite verses from the Bible is Mathew 11:28–30. These words are balm for a mother's heart. Because of Christ, God accepts our worship to Him, messy or neat. In surrender of my frustration to God, I experienced a newfound joy and sense of community with my brothers and sisters in Christ. My seven-year-old son convinced us to stay for our church's fellowship lunch that morning, instead of sprinting to the car, and I'm thankful he did. On the van ride home, spirits high, appetites satisfied, and new acquaintances made, my five-year-old daughter stated exuberantly, "Mom, I love Sundays! I love being together as a family!" Our hearts were full. I'm so grateful that God is giving me the grace to embrace worship in every stage of life—even the most inconvenient. 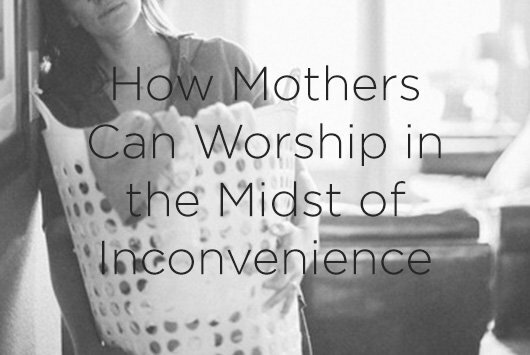 How are you worshiping God through some of the inconveniences that come with motherhood?